Do you want to allow people to book days? 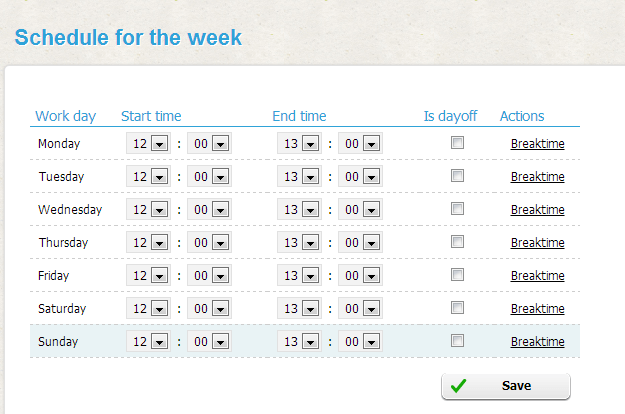 There are ways to adjust our system so that it allows daily bookings. You can see how it is done here below. Set the calendar so only 1 hour is bookable each day of the week. Set service duration as 1 hour for 1 day and 2 hours for 2 days, 3 hours for 3 days etc and set duration as hidden for each service which represents a number of days to book. 3. Go to Settings – Configuration, and set “Allow service to extend over closing hours:” as checked. 4. Go to Settings – Translation module and change name from Service provider/service etc to something else to fit your purpose. You clients can now select how long they want to rent (select a service), click on a day (and time), and the selected period will be booked. Your software doesn’t even look like this. There is no service duration “days”. You cannot book things longer than 23 hours. In our software you need to set it up as per the description, and then your service is set in hours (so 3 hours service would mean 3 days), and performer (room or whatever), would only be open 1 hours per day, which is when the rent/duration starts. You need to use Settings // Custom translation to fix texts on booking page according to your needs and allow services to go past closing hours. 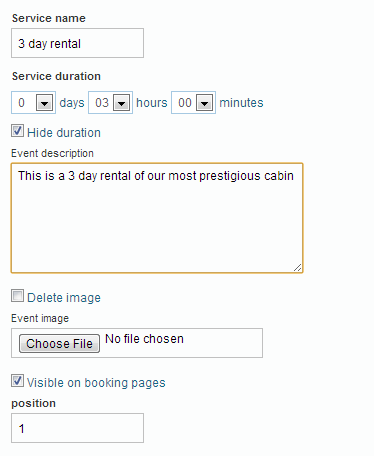 You also Hide duration in services and write in description that Duration is 1 day or 2 days etc.